So, what does one do after making the decision to leave America and become an expat? Plan an epic, massive, awesome road trip. My time as a Las Vegan is coming to a bittersweet end in a mere few days (the movers come Monday, June 11). Then, I’m off on a cross-country road trip adventure before I head to Thailand and Elephant Nature Park. Who is coming along for the ride? First, Dave, of What’s Dave Doing, will be joining me. No trip through the gorgeous southwest is complete without a stop in Utah at one of the stunning national parks. For this journey, we are parking it for two nights in Zion. I’ve lived in the area for a total of five-plus years, so Zion isn’t new to me. But, it is to Dave! While I’m not going to be doing any death defying Angel’s Landing adventures, I do plan on re-visiting this gorgeous enclave of nature … and chilling by our hotel’s pool for a bit. Then, we’re off to Colorado and TBEX — with a stopover to chill out in Denver and possibly drink some Fat Tire. After getting some travel blogger conference time in, Dave and I will part ways and the passenger seat will open up to one of my favorite travel bloggers in the universe, Erica from Over Yonderlust. Like Dave, we’ve never actually met in person, but through e-mail and phone conversations, I know I already adore the girl. After Colorado, we are heading to Omaha (someplace in middle America, you’re welcome), then Chicago to see one of my best travel girls, Katie, and to make sure Erica crosses off “eating a hot dog” in the Windy City from her bucket list. From Chicago, we are going to bop on down to Louisville, Kentucky to spend a few days with a good friend of mine, don fascinators and check out the Churchill Downs and even embark on a little bourbon tour. Then, we’re in the home stretch and headed to Maryland to drop off my car, go sailing with my dad and raise a glass in our nation’s capitol. What does this mean for the site? Well, for the next few weeks, as I pack, move and road trip it, there will be some guest posts to entertain. Then, once I’m back in the 301, it will be back to a more normal routine again! And, likely, tales of our epic adventures! Want to follow along on the journey? 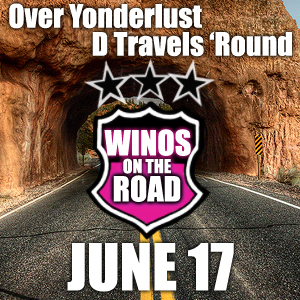 Be sure to check out #winosontheroad on Twitter, Instagram and our blogs. Have you done a cross-country road trip through America? Any places we should stop along the way? Leave a comment below and share your story! Sounds like a great adventure! I can’t think of a better way to spend your last few weeks in the States. I’ll be doing a cross-country trip myself in September as I drive from PA to CA! That is one heck of a trip!! Enjoy and be safe! What a perfect way to say goodbye to America! I will be at Tbex next week as well, can’t wait! Very excited for TBEX and to be around like-minded travelers! Sounds like a great time…good too see plenty of the homeland before heading off! Can’t wait! Already in Zion and loving it! It helps that my road trip buddy rocks! Mmm.. Fat Tire. This sounds like a great trip. Sailing too? Yup! A little bit of everything all smushed into a few weeks of awesome! Road trips are sweet, but when you travel with cool peeps, they really ARE EPIC. For your NEXT American road trip check out: Flagstaff, AZ, Austin, TX, Savannah, GA, Portland, OR, – for quaint/cool urban stops. DC, Philly are favorite stops of ours as well in addition to the biggies: NYC & SF! Camp in the Ozarks (Arkansas) – amazing natural springs! See Yosemite (CA) or just below in Kings Canyon (less touristy /no res needed). Mt. Shasta and the Redwoods are good summer camp spots too! Drives: California Coast (Start in Big Sur) up through the Oregon coast (all the way to Astoria – where The Goonies was filmed) That drive is out of this world! Oh and the Red Rocks in northern Arizona and Utah drive/hike/bike there, too. Drive from upstate New York to DC in the fall for very nice view of the changing colors. See monuments AT NIGHT – across the board. Empire State (NYC) Bld @ 2am. Lincoln Mem. (DC) after dark, Mt. Rushmore (SD) lit up at night. So much to see and just not enough time! Sounds like a fun road trip! I haven’t seen much of the middle of the US, though I did once drive from Atlanta to the Grand Canyon with some friends. I-10 through southern Texas is creepy at night. Anyway, I hope you’re having a great time! I did I-40 to Atlanta from the west. I think driving in Texas on those highways is creepy in general! The trip is great so far!! We stopped by Zion (and tackled Angel’s Landing) on our way to TBEX from Las Vegas. We can compare notes in Keystone! I love road trips! Make sure you have a lot of good music on your ipod and plenty of snacks. 😉 Enjoy TBEX! Good luck on your big trip, looking forward to hearing everything on your adventures! Thank you so much! The trip has been awesome so far!! So nice to meet you, too!! My friend is taking Erica and I on a Chicago tour of awesome — will mention the hot dog stop for sure!! 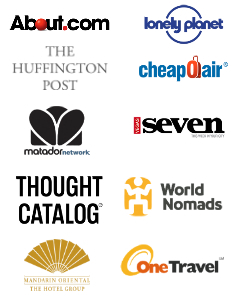 LOVE the travel-blogger collaboration. Hope you’re having fun on the road and drinking lots of wine/beer/bourbon/whatever! It is heaps of fun!! I don’t think there are many people I could do a road trip with … Erica is a blessing!! Sounds fun! Can’t wait for your posts!